They’re blue. Mother Nature didn’t spawn a vast variety of naturally blue flowers. In fact, there are very few blue specimens. 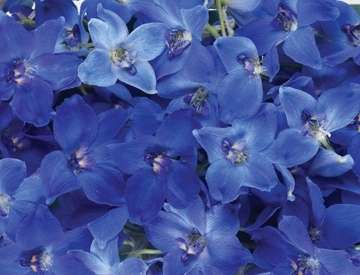 Delphinium rank as one of the best true blue flowers. They’re chic. Delphiniums are grown in pale and dark shades of blue as well as pinks, lavenders and creams. These multi-blossomed flowers mix well with all other floral varieties, especially those in shades of pink, green, white and yellow. They’re inspirational. Blue delphiniums remind us of the skies and the seas. When a fresh bouquet of these blue beauties is added to our living space its almost as if we’ve added a splash of the sea, sky or salty air to the room. They’re statuesque. Delphiniums are tall flowers. They will stand out in any arrangement with their spires of beautiful blossoms. They are not shy about making their presence known. They’re always in style. Just like the color blue is never out-of-date, neither is the delphinium. With over 250 species grown, the flowers make the perfect casual bouquet yet are equally at ease in a formal centerpiece.